The Multiverse theory, introduced in the 1980s, can explain the "luckily small" amount of dark energy in our Universe that enabled it to host life, among many universes that could not. 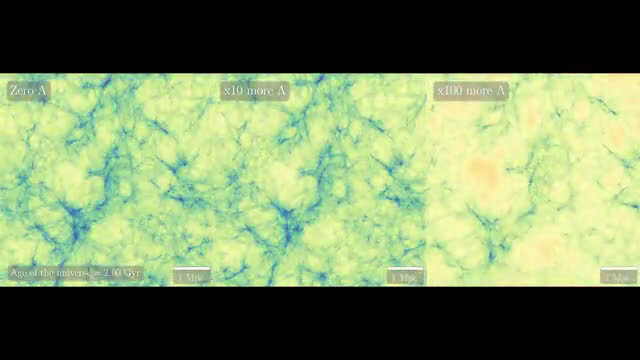 The simulations were produced under the EAGLE (Evolution and Assembly of GaLaxies and their Environments) project—one of the most realistic simulations of the observed Universe. Jaime Salcido, a postgraduate student in Durham University's Institute for Computational Cosmology, said: "For many physicists, the unexplained but seemingly special amount of dark energy in our Universe is a frustrating puzzle. "Our simulations show that even if there was much more dark energy or even very little in the Universe then it would only have a minimal effect on star and planet formation, raising the prospect that life could exist throughout the Multiverse." Dr. Luke Barnes, a John Templeton Research Fellow at Western Sydney University, said: "The Multiverse was previously thought to explain the observed value of dark energy as a lottery—we have a lucky ticket and live in the Universe that forms beautiful galaxies which permit life as we know it. "Our work shows that our ticket seems a little too lucky, so to speak. It's more special than it needs to be for life. This is a problem for the Multiverse; a puzzle remains." Dr. Pascal Elahi, Research Fellow at the University of Western Australia, said: "We asked ourselves how much dark energy can there be before life is impossible? Our simulations showed that the accelerated expansion driven by dark energy has hardly any impact on the birth of stars, and hence places for life to arise. Even increasing dark energy many hundreds of times might not be enough to make a dead universe." According to the research, if we live in a Multiverse, we'd expect to observe much more dark energy than we do—perhaps 50 times more than we see in our Universe. Professor Richard Bower, in Durham University's Institute for Computational Cosmology, said: "The formation of stars in a universe is a battle between the attraction of gravity, and the repulsion of dark energy. 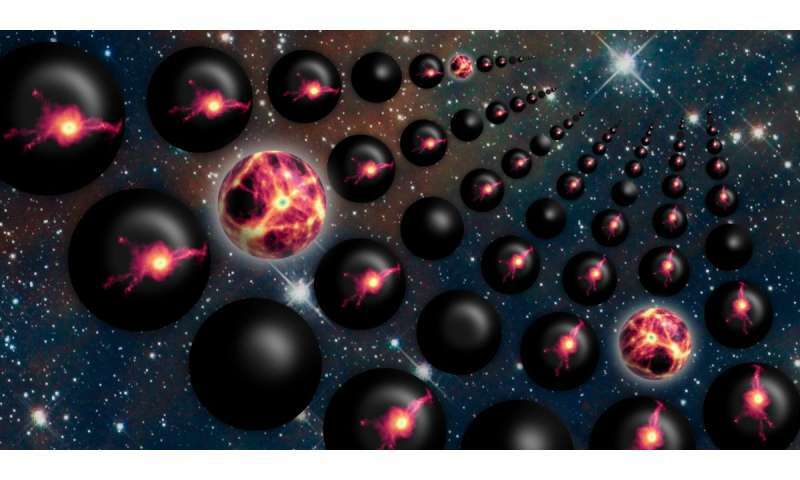 The "multiverse" is not falsifiable, thus not science, nonsense, non-science. At a distance of 50 to 60 MLY (or sooner. 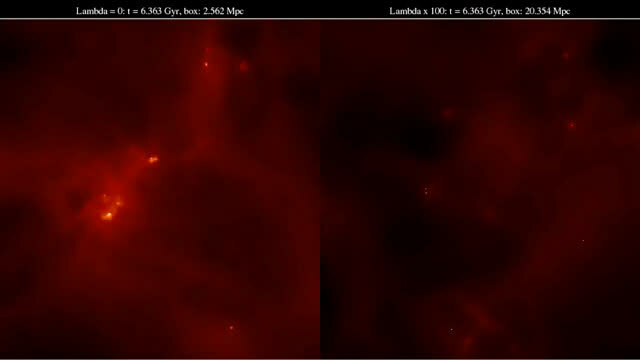 50-60 MLY) are visible terrible speed expansion of the universe. "At the distance of 52 ± 3 (M86) there is a blue shift (-244 ± 5 km/s) that is also present with the galaxy M90 at the distance of 58.7 ± 2.8 (−282 ± 4), while the other galaxies at the same distance (Messier 61, NGC 4216 , Messier 60, NGC 4526, Messier 99 (except NGC 4419 -0,0009 (-342)) are with a positive sign and completely different speeds. Well, maybe. AFAIK there are serious papers out there that consider that multiverses could leave an imprint on the CMBR and how such an imprint might look like (e.g. that the 'cold spot' could be such an imprint). So I wouldn't discount mutiverse-theories as unfalsifiable just yet. Dark energy= backhanded spacer connectivity information, which the shape of can be discerned via absence. Measuring holes, in a way. It's not about the dots but about where the dot's aren't. But such a point in analysis is purely linear minded and physically grounded. But it does make for a nice hint, this dark energy/matter issue. The sytem does not work like that and linear thinking is a very bad incomplete distortion of the the whole logic system of human analysis. A childish limited thought misfit of a brain damaged child, it is. the whole package is required for whole discernment. the usual: question is equal to the answer. The human and mind in the attempt to solve the equation must rise to the complexity of the scenario. It wears Godel's incompleteness scenario on it's sleeve for the more aware to see. One cannot bring the problem down, one must rise to it. Linear minded 'realism' science will never get there. It is literally impossible. Actually, you could make a logical argument that would go something like this: Assume that energy conservation must hold, perfectly. Think of this in terms of measurable vector quantities. so that every vector must be cancelled by a precisely equal and opposite vector, and that this principle must hold for every measurable quantity. Is the observable universe large enough to guarantee such conservation? A case could be made that it is not. In fact, a case could be made that no finite universe guarantees rigid energy conservation (we're assuming, in other words that the grand total of every measureable quantity MUST be zero if we sum across the universe). Just think of the matter/anti-matter imbalance in our observable universe. So, once we have an infinite universe by logical necessity, the multi-verse question is moot. An infinite universe IS a multi-verse since it contains infinitely many distinct "observable universes", depending on an observer's location. Convincing? Or not? God's backside could leave the same imprint on the CMBR. Falsifiability is sniffing, that will never happen by a corporeal human. Does the ego survive discorporation? "I'm sick of parallel Bender lording his cowboy hat over me!" Why does the article keep referencing the "luckily small" amount of dark energy in our Universe? Every article I have read always quotes that it makes up around 70% of the observable universe. Hardly a paltry amount.And how can they run a model with up to a few 100 times or even 10 times the observable amount? Is the universe 700% bigger than the sum of its parts? Or 7000%. Very confusing.I'm sure one of the expert readers could explain it to me. And also,in the artists rendition of the cosmic bowling alley above what exactly is postulated to be the "space between the separate universes? Other 'verses would have varying ligth/dark matter ratios, I'm sure. Regardless, it's own version of "life" would exist. Dark matter and energy can only show that our model is incomplete/wrong. Assuming our model is correct and we are just missing mass somewhere etc. is a logical fallacy. The only thing we know for sure is there is an issue with our model. Our current explanations for DM for instance are only some of the many possibilities. One very important aspect is that neither DM nor DE have been measured at the level of solar systems or smaller. These issues only come up at the largest scales. This is a big indication we are likely missing some kind of emergent phenomenon. LOL, a Marvel superhero comic book is more relevant scientifically than the nonsensical claptrap found here. Morons one and all! My goodness! Such absolute certainty from so many commentators. Without any verified experiments or confirmed empirical evidence. With the contributing scientists themselves pointing out there are many unknowns still to be parsed and corrected. Please to pander to my curiosity. Are all you guys sharing the same mutually agreed opinion acclaiming the same unproven speculation? Or do each of you have your own, conflicting, hypothesis? And you just take turns declaiming your personal delusion of correct thought? After all; your personal opinion must be absolutely correct. Without any possibility of error. Or even reconsideration and no attempt at editorial judgement permitted. Cause, you said so in am opinion comment on the internet. And...Your credentials? For disputing the competency and honesty of the researchers listed as contributing to this article. "Could a multiverse be hospitable to life?" If not - who cares? @gyre I have no idea what the emergent phenomenon would be, but if I did I would have said so. Modified gravity is one example of DM theory that tries to address the issue via an alteration the the formula for gravity, but doesn't quite work. The discrepancy between reality and model shows up in galaxy rotation curves, but that does not mean it is necessarily due to gravity. The discrepancy is only a symptom of a faulty model, not necessarily the the actual issue. Cosmologists should be going over every assumption they have made. Which if you actually know anything about cosmology you would realize pretty much everything we know is an assumption. I made a nice post up there that is difficult to discern. Kinda even ...garbled. I need some of you to downvote it so I can feel normal. Like... in my space. If the universe we live in is part of a multiverse, and we exist in it, why would we assume different constants of nature to parts of the multiverse we know absolutely nothing about? I'm not saying that it isn't possible that other 'universes' could have different values for things like the strong force (for eg), but to assume them to be different than the ones we know about is rather ridiculous. Why would God only fine-tune this universe and not all the others he's created? @Kron who says god created other universes assuming they even exist? In fact, there is no proof he even exists or created this one. If the universe we live in is part of a multiverse, and we exist in it, why would we assume different constants of nature to parts of the multiverse we know absolutely nothing about? Quantum fluctuations during inflation could lead to creation of countless universes with different "constants" of nature. The point of a multiverse is that there is no fine-tuning. Vast majority of universes is badly tuned, and they do exist out there, far beyond the observable horizon. We find ourselves in a certain universe compatible with life, simply because we could not exist in a badly tuned universe. @gyre I have no idea what the emergent phenomenon would be, but if I did I would have said so. Cosmologists should be going over every assumption they have made. Which if you actually know anything about cosmology you would realize pretty much everything we know is an assumption. When you really dive into it... Wouldn't an infinite collection of Universes be more likely to have created a god...?
. We find ourselves in a certain universe compatible with life, simply because we could not exist in a badly tuned universe. .. Wouldn't an infinite collection of Universes be more likely to have created a god...? I thought one of the main 'points' of a 'god' was that 'he' created the universe (as opposed to the universe creating him) so to 'explain existence' (even though that and any other goddidit actually explains nothing). If the universe itself is supposed to have create this 'god' then that would remove that particular 'point' of having this 'god'. Who created the Universe if it was not God! Infinite number of universes in our infinite space. This is the multiverse theory; universes outside our universe are infinite universes attracting our universe accelerating our universe. It certainly puts a dampener on the theory of an expanding space and time (George's Lemaitre's expanding cosmic egg) outside our space is infinite space. How the mighty einsteinium theoreticians have fallen. So in these other universes outside ours what reason do they have for their universe expanding, what theory do they have for galaxy rotation, is their darkmatter theory the same as ours and who is their equivalent of George's Lemaitre and has their equivalent of Albert Einstein forbidden travelling faster than photons and is all this the same in the Infinite number of universes in our infinite space. @Gyre in my opinion it could be in part due to not fully understanding gravitational time dilation. For instance, Einstein's relatively may only be an approximation. His theory bends space and time to make every observer measure the same speed of light. But, we don't have good data around black holes for instance to tell if the theory holds up. That would imply the 'purpose' of the universes isn't for us humans but for some other (mysterious) purpose. Although I find it implausible that there is a 'purpose' of the universes, at least that hypothesis is a refreshing change from the usual arrogance that we are so special and superior that the whole entire universe was made specifically for us. Perhaps it was made for the ants? @gyre assuming Big Bang theory is correct, measuring red shift drift of objects a certain distances would allow us to determine the rate of expansion of the universe at different points of time directly. Also, it would allow us to test the assumption that expansion was uniform across the universe. Maybe different sections expanded faster or slower than others. I hope we will be able to measure this value in the near future. Think of the big bang as initial agitation and ripples in a 2d pond, and you'll eventually get there. Is red shift subject to relativity...? Why would you think of it as 2d? This is a clear case of the fallacy of the excluded middle. Assuming that the most likely point is at one of the extremes. This excludes the middle. In this case assuming that a particular planet is either hospitable or inhospitable rather than thinking that planets form a continuum between hospitable and inhospitable. Like saying things are red, green, or blue, rather than mixtures of them. String theory could be relevant to this topic. One of the criticisms of string theory is that the characteristics of our universe is just a very small subset of all the possibilities that are included in String Theory. But, all the other possibilities could be included in a multiverse. Which would mean all the universes would likely have different basic properties. However, we have no idea if there is other life in this universe let along if life exists in other universes if said other universes even exist.